Ever since it first premiered, Mozart’s quasi-moralising opera Don Giovanni has taught its audiences about the gates of hell that await those who can’t live up to civic standards. Our title character, part-time aristocrat and full-time seducer, gets punished (and, in Guth’s production, shot) for his loose, cruel and violent behavior. 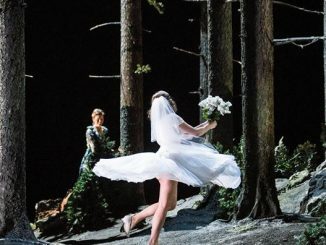 At the same time, the opera – and this production in particular – seems to promote licentious risk-taking behaviour for the female part of the audience. ‘Dump your lousy husband for the bad boy-aristocrat! Abandon your morals,’ it similarly seems to advocate. 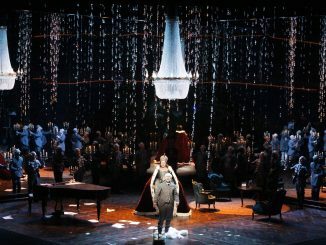 In a sense, this Don Giovanni is a safe bet for the Dutch National Opera: Claus Guth’s interpretation of Don Giovanni is an artistically renowned production that premiered at the Salzburger Festspiele in 2008, and features a cast familiar with the opera and a conductor with a solid track record. 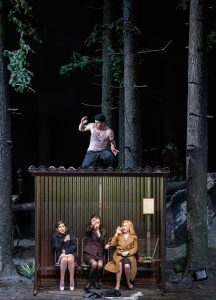 The opera is set in a run-down forest, which every character seems to regard as the best place to settle their own shady businesses. Guth, of course, takes some freedom from the original libretto, but he refrains from going on a full regietheater-rampage. His major feat is the personenregie, even though his enthusiasm for depicting emotional conflicts sometimes goes at the expense of the clarity of singing. 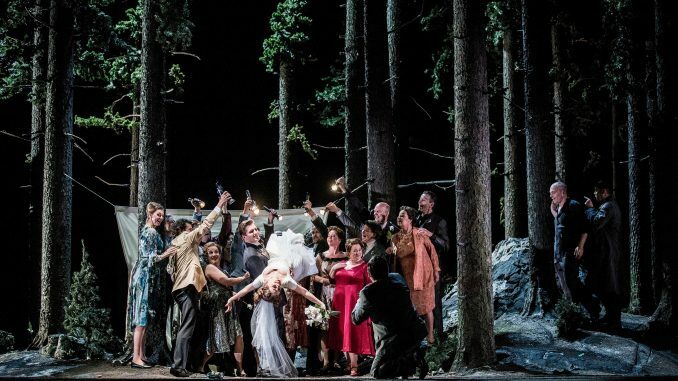 No park and bark for Don Giovanni’s cast: it’s all about running and shouting, seducing and deceiving, partying and punching people. Kudos for Guth for typecasting his singers to death. 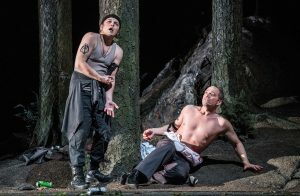 Christoper Maltman (Don Giovanni) and Adrian Sâmpetrean (a glorious Leporello) are cast as a two-man goon squad and womanising partners in crime. They play their roles with the right level of enthusiasm and engagement. Véronique Gens (Donna Elvira) is cast as the keeping-up-appearances-type who has made some pretty poor life choices in the past. Meanwhile, Sally Matthews (Donna Anna) is a sexually confused chain smoker who picks Don Giovanni over her nice-guy-fiancé Don Ottavio, played by Juan Francisco Gatell. Sabina Puértolas plays the role of the fresh and happy bride Zerlina who is about to cheat on her new husband Iurii Samoilov (Masetto) without giving it all too much thought. Yes, Guth’s forest is inhabited by stereotypes, but this isn’t a bad thing at all. The male part of the cast had some trouble in terms of performance. Ukrainian tenor Iurii Samiolov didn’t quite possess the power to project his moment-of-fame-aria over the orchestra and Juan Francisco Gatell, playing the role of Don Ottavio, had trouble staying in tune at some times. Christopher Maltman, returning to the role of Guth’s Don Giovanni in all of its retakes, sung well, but not excellent. On the other hand, Leporello and all of the female roles lived up to expectations. The trio Sally Matthews, Véronique Gens, and Sabiona Puértolas turned out to form a dream them when it comes to singing with – and bitching about – Don Giovanni. Adrian Sâmpetrean, singing Leporello, was rightfully hailed as the evening’s star during the curtain calls. Albrecht’s vigorous interpretation doesn’t disappoint, and the Nederlands Kamerorkest (Dutch Chamber Orchestra) performs brilliantly. Then again, there is little that could have gone wrong with this tried-and-tested production, solid cast and conductor. Any flaws were mostly minor details that did not derail the overall experience and quality of the performance. Mozart: Don Giovanni at De Nationale Opera, in performance from May 7 to May 29. Seen: 10-05-16.